I haven't counted, but I think Cloud Cuckoo Palace is also winning in the new element stakes, with a whole bunch of parts in new colours. Ones that you probably never expected to see! So I don't think today's post is especially full of new elements you really need... but using a kooky part in a kooky colour in your models is always great fun. I won't list them all as you can doubtless spot many large elements in shades of pink, blue and green and wonderful printed parts like the 'umbrellas'. But it's amusing to note that the new Gothic half-arch, previously only available in Black and White, here it comes in Bright Pink [BL]/Light Purple [TLG]! Another interesting large part is the green castle wall with an arched window, an unusual part to get in such a shade. I'm not certain what shade it is though - it looks to be lighter than the common colour Lime [BL]/Bright Yellowish Green [TLG], but I suspect this is just because of the light striking it in this pic. Lighter shades of green do exist in the LEGO® colour palette, but one of those has only been used in DUPLO® so far and the others are seemingly discontinued. So if this wall element is not Lime, that would be rather exciting. 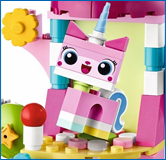 Unikitty is made almost entirely out of interesting elements, and two are new parts altogether. The tail is very odd and could be useful as decoration and the horn, which I would hazard a guess is Medium Blue, will surely come out in more colours in future - it will make a good drill for starters. 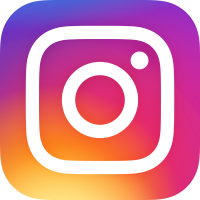 I'm glad to note that it is attached to a 'holey dot', a terribly useful part that doesn't appear in official sets very often as yet. The 1X1 plate that makes the front feet of Unikitty could be of more use; it looks like Light Aqua [BL]/Aqua [TLG]. And the rear foot - is that Bright Light Yellow [BL]/Cool Yellow [TLG], as with the curved corner plate below it? It's hard to say for certain, and I've been caught out before attempting to guess correct colours based on pictures! There's another new part and whilst it doesn't seem terribly useful, it is intriguing. It comes in a lot of The LEGO Movie sets, because it's attached to the main character, Emmet - it's his red backpack thingy. Here are some more pics of it - these are details from other LEGO Movie sets. Essentially it looks like two stacked 1X1 red bricks, but there is no visible join, so it is one part - a 1X1X2 brick. Also, it connects on one side to the minifig bracket he wears. These brackets (currently) come either with a stud or a Technic snap, but it can't be the latter version as you would see the hole from the rear. So the red part must have anti-stud hole, like an Erling brick. But where does this hole sit exactly? Judging by these pics, and my own little test (see end of post), my guess is that this part is the equivalent of stacking two 1X1 plates, then an Erling, then a final 1X1 plate on top. Weird eh? 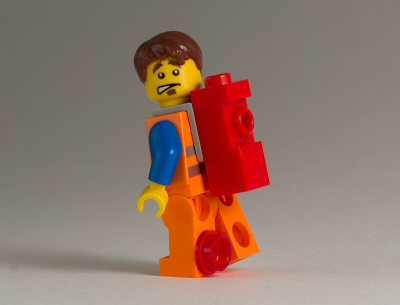 But as Mark Stafford pointed out, it is primarily a minifig accessory rather than a standard building brick, so that could explain how something so odd got through. This mutant brick might have some unique applications, as having the equivalent of an Erling without the 'headlight' at the front is useful - so long as you can fit a brick this tall into your build, and so long as your build is red! Overall it doesn't feel terribly useful to me, and given that TLG are very selective about creating new moulds, it seems a very strange choice for a new part. However, perhaps it is an important plot device. Emmet is seen sporting it most of the time, and if I'm analysing these few seconds of the official trailer correctly, it seems to be glued to him, at a critical moment in the movie - after falling through the 'rabbit hole'. The other interesting thing is that the movie version doesn't seem to have a stud on top. As mentioned, here's my rudimentary attempt at replicating Emmet from my current collection! 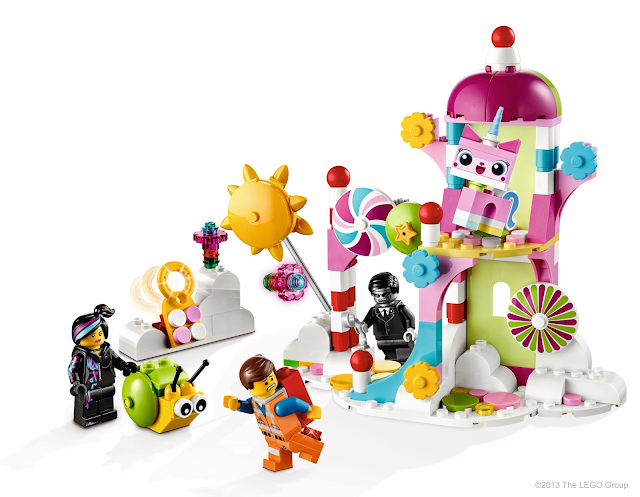 The LEGO Movie sets go on sale in the US on 29 December - I imagine we'll be waiting until the summer here in Europe. The horn is not a new mold. It's the same as the horns from the Kingdoms horses: http://www.bricklink.com/catalogItem.asp?P=89522. It has in fact been used as a drill in LEGO Atlantis and as the end of a spear in LEGO Ninjago. I'd guess its color is Light Royal Blue rather than Medium Blue, but I guess we won't know for sure until the set is out, or until an inventory is released by TLG! Spring Yellowish Green (the only green lighter than Bright Yellowish Green currently on the palette) doesn't ONLY come in Duplo... but the only free-standing System example is the textile skirt of the Minifigures Series 8 Fairy. According to Bricklink, this is also the color of the arms of the ghosts in 79008 Pirate Ship Ambush from the Lord of the Rings theme, and that seems accurate to me — as you point out, all other green colors that it could be confused with are discontinued. Uni-Kitty's "necklace" stud looks like it might also be the same color! The Cool Yellow parts are very good to see,, if only because Cool Yellow is a terribly underused color. My twin brother and I have been trying to make some brick-built ponies from My Little Pony: Friendship is Magic, but we won't be able to make a Fluttershy until more basic bricks and plates appear in Cool Yellow and Light Purple. Sadly, this set doesn't offer much that will be useful for that purpose, but nevertheless I can see that big Cool Yellow plate going to good use in a LEGO Friends building or just as sand on a brightly-colored beach, and the small one brings us one step closer to Cool Yellow brick-sculptures. Bright Purple (Dark Pink) cheese wedges are also new (sadly, another amazing new recolor Uni-Kitty provides woefully insufficient quantities of — though the LEGO Friends and Disney Princess themes might help with that in the future). And in minifigure accessories, let's not forget the hoodie element around Wyldstyle's neck! Being black and apparently unprinted, it will have all kinds of uses. Overall, I love that the LEGO Group is daring enough to release this set as part of a highly-anticipated line. It means either that the target audience for this theme is expected to be more progressive and egalitarian than I would have anticipated, or the LEGO Group isn't afraid to shake things up a bit when it comes to conventional gendered interests. I'd be happy with either of those scenarios! In set descriptions on the website, that red brick is referred to as the Piece of Resistance - certainly sounds like an important plot point! Ah thanks, I couldn't find any references, do you remember where you read that? In the description of 70801 Melting Room (http://www.lego.com/en-us/movie/products/products/70801): "A Robo SWAT has chained and cuffed Emmet to a tilting, rotating laser machine and is trying to zap the Piece of Resistance from his back using a huge adjustable laser." 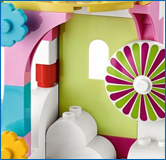 I do think the castle wall piece is Spring Yellowish Green, if that's the Duplo color you're referring to. As for the red piece, from the descriptions I've seen it seems that piece is a necessary part of whatever doomsday device Lord Business is trying to build. One piece that is not really a building element but will be appreciated by many fans anyway is Wyldstyle's pulled-back hood piece. I can see that appearing in many other applications (most notably Star Wars), and I'm sure fig customizers will have a ball with it. The tan Power Miner's drill in 70804 Ice Cream Machine could be interesting. It's a fairly specialized element, but I could see it being used for, say, a giant sand castle turret roof. Finally, don't forget about one of the coolest recolors in the sets revealed so far: the clear Army Men bases in Lord Business's evil lair! That should be a great building element, whether you want to use it as the base for a display stand or as any sort of clear puddle.